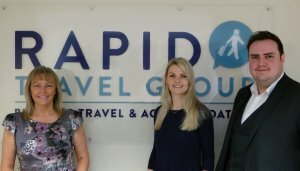 Local company, Rapid Accommodation & Travel specialists has just announced an exciting office expansion at Laceby Business Park due to rapid growth within the travel services sector. Doubling office space and expanding the travel team by 100%. We made the move to Laceby Business Park in February 2018 to accommodate our business needs, since doubling the team and adding to our customer offerings, we are in an exciting transition and subsequently doubling the size of our offices; taking on business Suite 5 in March this year. Within in a year, we have seen such Rapid growth. Ms Anderson-Smith concluded: “We see our business continuing to expand in future years. The growth of the offshore industry, chemical sectors and food industries in the locality is such that we are able to provide that one-stop shop solution to the operators of these businesses both locally and internationally. Rapid’s travel platform therefore allows us to tailor our client needs in a cost-effective way, for Corporates and SME’s. We think it’s great here!